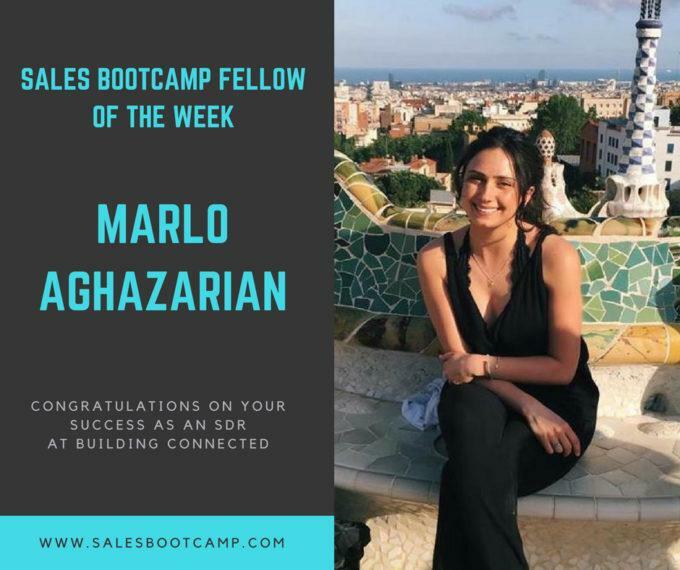 Congratulations to Marlo Aghazarian for being recognized as Sales Bootcamp’s Fellow of the Week! Our team here at Sales Bootcamp introduced her to BuildingConnected in August 2017, where she has been excelling as an SDR ever since. We are excited to highlight her accomplishments as an SDR at BuildingConnected in New York! When Marlo began her job search post-graduation, she applied to a wide variety of jobs and didn’t have any sales experience. When she found Sales Bootcamp, Marlo thought it would be a great way to gain insight into the sales world while getting a foot in the door at some of our partner companies. She had a very smooth interview process and transition into her new role as an SDR at BuildingConnected, and even moved from the Bay Area to New York City for the opportunity. In her first few weeks on the job, Marlo focused on absorbing a ton of information. She was simultaneously learning about sales, BuildingConnected’s industry, and the product. Marlo absorbed everything she was taught, then went to the experts of each of those fields within her company and asked as many questions as possible to really get a grasp on her role. At first, the SDR role was a bit nerve racking as Marlo wasn’t used to talking to strangers on the phone for hours a day, but she quickly realized that they are just people and the worst that could happen is someone saying no. She learned that she just had to build out the confidence to perform well. Sales Bootcamp helped Marlo adjust to the SDR role by giving her specific ideas and strategies around how to approach the calls. She also learned that the more you do it and practice, the better you’ll get at it. Marlo took a huge leap to move out to New York City for her Sales Bootcamp Fellowship, and it certainly seemed to be worth it. Great work in your role at BuildingConnected, Marlo, and we look forward to supporting your future sales career!